2009-07-07 First worldwide family litigation filed litigation Critical https://patents.darts-ip.com/?family=33299579&utm_source=google_patent&utm_medium=platform_link&utm_campaign=public_patent_search&patent=EP1486195(B1) "Global patent litigation dataset” by Darts-ip is licensed under a Creative Commons Attribution 4.0 International License. The present invention comprises a structured pre-mix or "delivery vehicle" composition (structured hydrophobic benefit agent(s)) designed to enhance the effect of separate optical modifiers delivered from the same personal product compositions (e.g., liquid soap, bar soaps, creams, emulsions, non-wovens etc.). Specifically, the optical modifier(s) may be entrapped within a network formed by the structured benefit agent (e.g., delivered by the structured benefit agent), or the presence of the structured benefit agent in the final composition may simply enhance activity of the separate optical modifier. When the structured benefit agent composition is separately prepared and combined with the personal product composition (preferably while the structured, pre-mix composition is still in a molten or liquid state), a personal product composition containing the structured benefit agent provides enhanced delivery of the benefit agent(s) and, at the same time, allows separate optical modifier to have an enhanced effect resulting in changes in the visual appearance of skin. The separate optical modifier(s) may be incorporated into the structured benefit agent delivery vehicle, or may be added separately from the pre-mix to deliver enhanced visual appearance, e.g., shine on the skin. Optical modifiers can provide benefits in visual appearance to the skin or hair. At present, however, it is extremely difficult to achieve high levels of deposition and/or to enhance the effects of optical modifiers when delivered from personal product compositions, including but not limited to personal wash liquid cleansers and personal product bars. While this and co-pending applications are described with personal product language, to the extent the structured benefit agents can be used in a variety of compositions where deposition by benefit agents is desirable (e.g., hair, deodorant), the claims are intended to be read expansively and limited only by the structuring component. Specifically, the applicants have found that the use of "structured" benefit agents (the structured benefit agent compositions are separate from the optical modifier) help to enhance the effect of the optical modifiers. The structured benefit agent may carry or entrap the optical modifier(s), or the modifier may have been added separately rather than in a pre-mix used to form the structured benefit agent. In the presence of the structured benefit agent, the separate optical modifier displays an enhanced visual appearance (e.g., shine) compared to the effect of the same optical modifier delivered in formulations where structured benefit agent is not used. According to the invention, preferably the benefit agent being structured and structuring material (e.g., crystalline wax, hydrogenated oil or fat) are separate components. Specifically, the invention relates to the use of benefit agents structured by particular crystalline structurant or structurants (i.e., so that the crystals have specifically defined aspect ratios) wherein, when structured benefit agent is separately prepared before combining with personal product composition, it provides enhanced properties to separate optical modifiers (carried on/within the structured benefit agent or added separately). Enhanced properties may be the result of enhanced deposition of the "structured," benefit agent or other mechanism, but this is not critical to the invention. Unlike prior art references where deposition is dependent on the large size of the benefit agent droplets (e.g., >50 micrometers), the deposition results of the subject invention have no requirement of large droplet size, and are not dependent in size. The structurants which are used to structure the carrying benefit agent are natural or synthetic crystalline waxes. Among natural waxes are included petroleum derived waxes such as paraffins and microcrystalline waxes; as well as animal and plant (vegetable) waxes. Among the synthetic crystalline waxes which may be used are crystalline polymers such as polyethylene. When the structured benefit agent(s) carries/entraps optical modifiers (or structured benefit agents are present in final formulation, even if modifiers are added separate from pre-mix), visual changes in skin appearance are achievable. Particles having a wide range of shapes, surface characteristics, and hardness characteristics can be utilized to provide the optical effect of these optical modifiers. The water-insoluble particles of the present invention can be derived from a wide variety of materials including those derived from inorganic, organic, natural, and synthetic sources. Some prior art references purport to use rheological parameters to select oils or oil blends to be used for improving deposition or providing favorable sensory feel. U.S. Patent No. 5,674,511 to Kacher et al. , for example, describes the use of solubility parameters and four rheological parameters to select benefit agents (i.e., oil or oil blends) that can be used in moisturizing cleansing formulations to improve deposition and provide favorable sensory feels. Petrolatum and petrolatum-containing mixtures are said to be favorable selections. The reference fails to teach or suggest the building of a deformable network of crystals within the benefit agent, and which crystals must have a specific aspect ratio. The Kacher reference fails to teach or suggest that the structured benefit agent be combined with other components in the compositions in a molten, semi-molten or solid state. Also, it does not describe separate benefit agent and structurant, as is preferred by the subject invention (i.e., in the subject invention, if petrolatum is used, it is preferably used as a structurant to structure other benefit agents, rather than itself comprise the structured benefit agent). In short, the benefit agents (e.g., oils) of Kacher clearly do not appear to be internally structured delivery vehicles like those used in the compositions of the invention which are separately prepared, and wherein the structurant has defined aspect ratio. A number of prior art references disclose generally the concept of an oil additive which can thicken or stabilize oils. They do not, however teach or disclose that specific crystalline structurant (i.e., having a defined aspect ratio), when prepared in combination with a benefit agent as a pre-mix/delivery vehicle will enhance properties of a separate optical modifier which is carried or entrapped by the structured benefit agent, or which optical modifier is found in the final formulation with the structured benefit agent. U.S. Patent No. 5,804,540 to Tsaur et al. and U.S. Patent No. 5,661,189 to Grieveson , for example, disclose use of both crystalline or micro-crystalline waxes and hydrophobic polymers to thicken low viscosity oil, so as to control the oil droplet size (i.e., it must attain a certain minimum size to deposit) as well as to maintain high lather. As noted above, however, there is no discussion of the criticality of crystalline structure (aspect ratio), or that a thickened benefit agent must be separately prepared and added in a molten, semi-molten or solid state. Further, as noted, there is no recognition that it is critical the thickener must be a specific natural or synthetic crystalline structuring material (as defined in the subject invention). In co-pending U.S. Patent Application Nos. 09/859, 862 to Aronson et al. (entitled "Wet-Skin Treatment Composition"), filed May 17, 2001 and 09/859,849 to Aronson et al. (entitled "Method of Enhanced Moisture or Reduced Drying Using Wet-Skin Treatment Compositions"), there are disclosed benefit agents which provide a draggy feel. There is no teaching or disclosure, however, of using benefit agent structured with crystalline materials of specific aspect ratio (and carrying, containing or in the presence of optical modifiers), or of how to produce such. No prior art of which applicants are aware demonstrates the use of natural or synthetic crystalline structurants (e.g., wax), having specific aspect ratio of crystals and prepared as a pre-mix, to enhance the properties of optical modifiers (through the enhanced deposition of the structured benefit agent carrying the modifier, or through other mechanism). Accordingly, the present invention relates to personal product compositions (including liquid soap, creams, emulsions, non-wovens, bars), according to claim 1. Optical modifiers which may be used to provide optical effects can be particles having a wide range of shapes, surface characteristics, and hardness characteristics. The water-insoluble particles of the present invention can be derived from a wide variety of materials including those derived from inorganic, organic, natural, and synthetic sources. The structured benefit agent pre-mix should preferably pour sufficiently so that it can be added to the carrying composition which is why, generally, it will be in molten or semi-molten state. However, it can also be added in a solid state. The deposition of the benefit agent in the structured benefit agent is not dependent on large droplet size of the structured benefit agents (i.e., it can be small or large drops). The use of structured benefit agent also enhances delivery of separate benefit agents in the pre-mix (which may or may not be structured), and of separate benefit agents added separately from the pre-mix. As noted, the structured benefit agent or delivery vehicle of this invention may be used in bar or non-bar (preferably liquid), personal product compositions. The composition will comprise (a) 1 to 99 %, preferably 1 % to 75 % of a surfactant system comprising a surfactant or surfactants selected from the group consisting of anionic, nonionic, amphoteric/zwitterionic, cationic surfactants and mixtures thereof and (b) 0.1 % to 90 %, preferably 0.5 % to 80 %, even more preferably 1 % - 40 % by weight of the structured benefit agent delivery vehicle as defined above. (3) if necessary, because the mixture had been heated, cooling the resulting mixture to room temperature. (4) cooling the resulting mixture to flakes (e.g., by passing the resulting mixture over a chill roll), taking the flakes (e.g., from the chill roll) and extruding the material into a billet which is then formed or stamped. In another embodiment, the invention provides a method for providing enhanced visual shine of at least 5 intensity units, according to claim 11. Optical modifiers generally may comprise about 0.1 % to 3 % by wt., preferably 0.2 % to 2.5 % by wt., more preferably 0.5 % to 2 % by wt. of the cleanser. Figure 2 is a plot showing shear thinning behaviour of structured benefit agents of the invention versus an unstructured benefit agent. Ultraflex amber wax and Victory amber wax were each mixed with sunflower seed oil at a ratio of wax/oil of 1:4. For comparison, the viscosity behavior with shear of unstructured sunflower seed oil is also shown. Plotted is viscosity versus shear rate. At low shear rates the viscosity of structured benefit agents, sunflower seed oil structured with wax (Ultraflex amber wax or Victory amber wax) is very high. As the applied shear rate is increased the viscosity of the structured benefit agents decreases and continues to decrease at the higher shear rates. At sufficiently high shear rates the viscosity of structured benefit agents approaches that of the pure unstructured benefit agent component. Figures 3a and 3b are schematics of typical crystal structurants of the invention having length "A" and width "B". As noted, the aspect or axial ratio of A/B must be greater than 1. The length is to be understood as the longer of the two dimensions when considering length and width. Figure 4 is a schematic of structurant crystals (which can be "plate-like") forming a three-dimensional network within the structured benefit agent (e.g., oil). The present invention relates to a personal product composition comprising a structured benefit agent delivery vehicle composition which, because of the structure of the crystal used to prepare it (for example, aspect ratio of the crystalline structurants), and, because of its manner of preparation (separately prepared), forms a structured benefit agent component which, when optionally cooled, has particular properties (e.g., yield stress, shear thinning). The structured benefit agent not only permits the benefit agent which is structured to deposit more efficiently from the composition, but also permits enhanced visual appearance (e.g., shine) by optical modifiers carried on or in the structured benefit agent or outside the pre-mix but in the presence of the structured benefit agent in the final composition. Yield stress parameters of the structured benefit agent can be 1 - 5000 Pa or higher and all ranges subsumed therein (see Figure 1) and shear thinning parameters can range from 2000 Pa-s (or higher) at low shear rates (0.1/sec) (i.e., viscosity of 1000 to 10,000 Pa-s as seen on the Y axis of Figure 2) to 0.1 Pa-s (or lower) at high shear rates (100/sec) (again, see Figure 2). Both yield stress and shear-thinning parameters/ranges are dependent on the level of benefit agent structurant added to benefit agent. When specific crystalline materials are used to structure the benefit agent, and when the process of the invention is used, the final composition containing the structured benefit agent vehicle will deliver the structured benefit agent to the skin or substrate at a level of at least about 5 % greater, preferably at least 10 % greater than if structured benefit agent is not used. Deposition is not dependent on large droplet size of the structured benefit agent droplets in the carrying composition (e.g., liquid soaps). Because of this enhanced deposition of the structured benefit agent, there is an improvement in the benefit of the optical modifier of at least 5 % (e.g., in one embodiment there is shine enhancement of greater than 5 intensity units). Optical modifiers can be particles having a wide range of shapes, surface characteristics, and hardness characteristics any of which can be utilized to provide optical effect. The water-insoluble particles of the present invention can be derived, for example, from a wide variety of materials including those derived from inorganic, organic, natural, and synthetic sources. Non-limiting examples of these materials include those selected from the group consisting of almond meal, alumina, aluminum oxide, titanium dioxide, mica, coated mica, sodium stearate, stearic acid, zinc stearate, aluminum silicate, apricot seed powder, attapulgite, barley flour, bismuth oxychloride, boron nitride, calcium carbonate, calcium phosphate, calcium pyrophosphate, calcium sulfate, cellulose, chalk, chitin, clay, corn cob meal, corn cob powder, corn flour, corn meal, corn starch, diatomaceous earth, dicalcium phosphate, dicalcium phosphate dihydrate, fullers earth, hydrated silica, hydroxyapatite, iron oxide, jojoba seed powder, kaolin, loofah, magnesium trisilicate, mica, microcrystalline cellulose, montmorillonite, oat bran, oat flour, oatmeal, peach pit powder, pecan shell powder, polybutylene, polyethylene, polyisobutylene, polymethylstyrene, polypropylene, polystyrene, polyurethane, nylon, teflon (i.e. polytetrafluoroethylene), polyhalogenated olefins, pumice rice bran, rye flour, sericite, silica, silk, sodium bicarbonate, sodium silicoaluminate, soy flour synthetic hectorite, talc, tin oxide, titanium dioxide, tricalcium phosphate, walnut shell powder, wheat bran, wheat flour, wheat starch, zirconium silicate, and mixtures thereof. Also useful are micronized particles made from mixed polymers (e.g., copolymers, terpolymers, etc. ), such as polyethylene/polypropylene copolymer, polyethylene/propylene/isobutylene copolymer, polyethylene/styrene copolymer, and the like. The "structured" benefit agent of the subject invention can be envisioned as an emollient droplet which has certain physical properties defined at least in part by the ability of the structured benefit agent to deliver the benefit agent more efficiently from the final composition. The structured benefit agent enhances properties of separate optical modifiers carried by, entrapped in, or in the presence of the structured benefit agent in the final formulation. More specifically, when structurants structure the benefit agent, the crystals in the benefit agent phase are believed to create a solid network which is apparently interconnected like a "house of cards" for plate-like crystals, or perhaps more like a scaffold structure when the crystalline structurant has rod/needle morphology. The crystals form a three-dimensional supporting network that, without wishing to be bound by theory, is believed to make the structured benefit agents more than just thickened benefit agents (see Figure 4). The crystalline structure changes the normally fluid benefit agent (e.g., vegetable or other oils) into solid-like materials that have good flow and spreading properties for benefit agent deposition. Through selection of structurant (e.g., wax) and calculation of structurant content, the structured benefit agent can be tailored to meet desired rheological parameters. An important part of the invention is that the crystal forming this 3-D network must have an aspect or axial ratio of length and width (A and B, respectively) such that A/B >1. This aspect ratio of the crystals is believed to enhance deposition of the structured benefit agent (see Figure 3). The length is to be understood as the longer of the two dimensions when considering both length and width. The structured benefit agents of the invention have been found to deposit much more effectively than if the benefit agent is not structured. Moreover, they enhance visual appearance benefits from separate optical modifiers. The structured benefit agent can be seen as a pre-mix, since it is a critical aspect of the invention that the benefit agent being structured and the crystalline structurant forming the "structure" be combined before adding to the carrying composition in which the structured benefit agent will be used. In this sense, the pre-mix or structured benefit agent is acting as a vehicle for delivery of the benefit agent. Further, the structured benefit agent may also enhance properties of separate optical modifiers either by carrying or entrapping these benefit agents in a network formed by the structured benefit agent, and also when another benefit agent is separately added to the pre-mix. (b) 50 to 0.1% by wt. (including all ranges subsumed therein) of the vehicle comprising crystalline structurant selected from the group consisting of natural and synthetic wax. The benefit agent may also optionally comprise optical modifiers, although there may be added separately outside the pre-mix forming the structured benefit agent and be present only in the final formulation with the structured benefit agent. The optical modifiers (carried or within the structured benefit agent carriers or in their presence in final formulation) may be single or mixture of two or more modifiers. Because of enhanced deposition of structured benefit agent, there is an improvement of the benefit provided of at least 5 % greater than if no structured benefit agent is used. For example, some optical modifiers may provide shine enhancement of at least 5, preferably at least 10 intensity units. A preferred list of optical modifier includes: particles having a wide range of shapes, surface characteristics, and hardness characteristics can be utilized to provide optical effect. The water-insoluble particles of the present invention can be derived from a wide variety of materials including those derived from inorganic, organic, natural, and synthetic sources. Non-limiting examples of these materials include those selected from the group consisting of almond meal, alumina, aluminum oxide, titanium dioxide, mica, coated mica, sodium stearate, stearic acid, zinc stearate, aluminum silicate, apricot seed powder, attapulgite, barley flour, bismuth oxychloride, boron nitride, calcium carbonate, calcium phosphate, calcium pyrophosphate, calcium sulfate, cellulose, chalk, chitin, clay, corn cob meal, corn cob powder, corn flour, corn meal, corn starch, diatomaceous earth, dicalcium phosphate, dicalcium phosphate dihydrate, fullers earth, hydrated silica, hydroxyapatite, iron oxide, jojoba seed powder, kaolin, loofah, magnesium trisilicate, mica, microcrystalline cellulose, montmorillonite, oat bran, oat flour, oatmeal, peach pit powder, pecan shell powder, polybutylene, polyethylene, polyisobutylene, polymethylstyrene, polypropylene, polystyrene, polyurethane, nylon, teflon (i.e. polytetrafluoroethylene), polyhalogenated olefins, pumice rice bran, rye flour, sericite, silica, silk, sodium bicarbonate, sodium silicoaluminate, soy flour synthetic hectorite, talc, tin oxide, titanium dioxide, tricalcium phosphate, walnut shell powder, wheat bran, wheat flour, wheat starch, zirconium silicate, and mixtures thereof. Also useful are micronized particles made from mixed polymers (e.g., copolymers, terpolymers, etc. ), such as polyethylene/polypropylene copolymer, polyethylene/propylene/isobutylene copolymer, polyethylene/styrene copolymer, and the like. This section refers to benefit agents which are structured and act as carrier carrying or entrapping optical modifiers. As noted, structured benefit agents can also be used to enhance properties of the optical modifiers even if those modifiers were added outside the pre-mix but are in the presence of the structured benefit agent in the final formulation. The structured benefit agent of the subject invention may be a single benefit agent component. Further the benefit agent may be a mixture of two or more components, one or all of which may have a beneficial aspect. The benefit agents can be emollients, moisturizers, anti-ageing agents, anti-inflammatory agents, skin-toning agents, skin lightening agents, sun screens, fragrances, etc. (o) mixtures of the foregoing. Although not listed above, hydrophilic benefit agents may also be entrapped in the structured benefit agent network of the pre-mix or separately added outside the pre-mix. This is discussed, for example, in the applicants' co-pending application relating to hydrophilic benefit agents hereby incorporated by reference into the subject application. The crystalline structurant used for "structuring" the benefit agent oil or emollient carrier of the subject invention may be a natural or synthetic crystalline wax. Mineral, animal or plant (vegetable) waxes are all described as natural waxes. Synthetic waxes are described as those waxes that have been synthetically polymerized from raw materials or chemically modified natural waxes. Among the natural crystalline waxes which may be used are petroleum based waxes such as paraffins and microcrystalline wax. Chemically, both microcrystalline (MC) and paraffin waxes are very similar, consisting of long saturated hydrocarbon chains. Both types of waxes are separated from crude petroleum with the MC waxes typically having higher molecular weights. Paraffin wax is extracted from the high boiling fractions of crude petroleum during the refining process by cooling and filtering. Following a sweating process to remove remaining oil in the wax, the resulting paraffin wax typically has less than 0.5 % oil. There are many different grades available, mostly varying in melting point. Generally, paraffin waxes are colorless or white and transparent. Paraffin waxes consist mainly of straight chain molecules with a small amount of branched-chain molecules having branching near the end of the chains. As a result of the long, straight chains, paraffin wax has large, well-formed crystals. Molecular weights of paraffin waxes generally range from 360 to 420 (26 to 30 carbon atoms), although versions with longer chains (molecular weights up to 600) are available. Typical melting points are 126-134°F (52-57°C), the high molecular weight versions have melting points near 170°F (77°C). Paraffin waxes are brittle and the addition of oil weakens the structure (lowers the tensile strength). Microcrystalline waxes (MC) differ from paraffin waxes in physical properties, chain structure and length, crystal type and in the process of manufacture. They are tougher, more flexible and have higher tensile strength and melting points than paraffin waxes. MC waxes have high affinity for oil which, when added, increases the wax plasticity. MC wax cannot be distilled without decomposition, and therefore is separated from the residual distillation fraction of crude petroleum by de-waxing processes involving recrystallization in organic solvents and centrifugation. Oil content varies with grade but is usually around 2 % to 12 %. MC waxes contain mostly branched-chain molecules located at random along the chain with some straight chains. Typical melting points are 145 to 195°F (63-91°C). The crystals of MC wax are small and irregular and consist of several types: plates, malcrystalline and needle. A high penetration number indicates flexibility of the wax, but flexibility is not a function of melting point. There are also other mineral waxes such as montan wax, lignite wax, osocerite, ceresin, utah wax and peat wax. Animal waxes can be obtained from such things as bees, insects or whales. These waxes include but are not limited to beeswax, Chinese wax, shellac wax, spermaceti and wool wax. Beeswax, for example, classified as an animal wax, is secreted by the honey bee to construct the honeycomb. The wax is harvested by melting the honeycomb and filtering away the wax. Natural beeswax is a crystalline solid and is composed of myricyl palmitate, cerotic acid and smaller amounts of hydrocarbons, cholesterol esters and ceryl alcohols. Beeswax has melting points around 61-65°C and is compatible with almost all waxes and oils. Plant waxes can be derived from beans, leaves and berries. Plant or vegetable waxes can include bayberry, candelilla, carnauba, cotton, esparto, fir, Japan, ouricury, palm, rice-oil, sugar cane, ucuhuba and cocoa butter. Among synthetic crystalline waxes which may be used are crystalline polymers such as polyethylene, Fischer-Tropsch waxes such as polymethylene, chemically modified waxes, polymerized alpha olefins and synthetic animal waxes. For example, siliconyl beeswax may be used which is beeswax that has been chemically modified. ** Penetration No. : Penetration number values as reported by manufacturers using the standard test method for needle penetration of petroleum waxes of the American Society for Testing and Materials (ASTM D1321). The depth of penetration of needle in tenths of a millimeter (dmm) is measured with a penetrometer that applies a standard needle to the sample for 5 seconds under a load of 100 grams. Another structuring material of the invention (e.g., used for structuring other benefit agents) is the microcrystalline wax petrolatum (also known as petrolatum or mineral jelly), which typically comprises about 90 % by wt. of a natural mixture of microcrystalline waxes plus minor amounts of other impurities. As noted above, the structurant in the structured benefit agent is believed to form a three-dimensional supporting network which is believed to make the structured benefits agent more than just thickened benefit agents. That is, it changes the consistency of the fluid benefit agent (e.g., oil) to a solid-like material having good spreading/deposition properties. Deposition is believed to occur by transfer of structured benefit agent droplets/particles to the substrate surface from the composition where the crystalline structure of the structuring material crystals (e.g., aspect ratio) is believed to help enhance affinity of the structured benefit agent to the substrate. Other benefit agents in the pre-mix may also structure, (i.e., 2 or more) or just one may structure and/or the other benefit agent may have enhanced deposition by being entrapped in the network formed by the structured benefits agent. The benefit agent preferably comprises 50 % to 99 % of vehicle while wax is 1 % to 50 %, more preferably 2 % to 45 % of benefit agent vehicle. When used, for example, as part of a cleanser emulsion where structuring material (e.g., wax) is 20 % of benefit agent phase, droplet diameters of the structured benefit agent may be in the range of 1-15 µm, with average droplets having a size of 4-8 µm. As noted, however, there is no requirement that droplets must be of this size. When incorporated into liquid cleanser formulations, the structured benefit agent droplets are generally solid when stored at room temperature and may be seen as particles. The droplets may be somewhat spherical but have a rough, textured surface, a result of the structurant crystal within the drops. It has also been noted that material with high crystalline structure (e.g., paraffin, microcrystalline wax) yields excellent deposition of benefit agent. As mentioned earlier, there is no large size requirement for the structured benefit agent droplets of the invention. Unlike prior art, the structured oils can deposit high oil amounts of structured benefit agent even at small droplet sizes, i.e., below 10 µm and possibly even submicron. The only criticality is that the shape of the structurant have high axial or aspect ratio (A/B>1). This is shown in Figure 3. The length is to be understood as the longer of the two dimensions when considering length and width. The fact that structuring exists is shown by high yield stress observed on benefit agents even when using low amount of structurant (see Figure 1). The structured benefit agent of the invention may also be used in combination with other materials that have been shown to enhance the deposition of hydrophobic benefit agents (e.g., cationic polymers, inorganic thickening agents such as clays or silicas, and polymer thickening agents). Finally, as noted, the structured benefit agent aids in enhancing effect of other non-structured benefit agents which are not part of pre-mix. This phenomenon is described, for example both here (for optical modifiers if not part of pre-mix) as well as other of applicants cofiled, co-pending applications. A critical aspect of the subject invention is that the benefit agent being structured and crystalline structurant must be combined (e.g., in a pre-mix) before they are combined with the remaining composition. The combination of such pre-mix with carrying composition should be when the structured benefit agent is in a molten, semi-molten or solid state and preferably, although not necessarily, such that it can be poured into the carrying composition. The combination of such pre-mix with carrying composition should preferably, although not necessarily, be when the structured benefit agent is in a molten or semi-molten state such that it can be poured into the carrying composition. That is, the viscosity of structured benefit agent pre-mix when mixing should be no higher than about 250 Pa-s, more preferably 200 Pa-s, most preferable 150 Pa-s. In one embodiment of the invention, the crystalline structurant and benefit agent are combined and may be heated to a temperature above the melting point of the structurant. These are then preferably mixed to uniformity. Preferably, the molten material is added to a carrying composition, preferably a surfactant containing carrying composition and maintained at the same temperature as the benefit agent and structurant mixture. After mixing (for about 10 seconds to an hour, preferably 5 minutes to 45 minutes), the mixture is cooled, if necessary, to room temperature. As noted, structurant is combined with benefit agent before addition to the carrying composition (e.g., aqueous surfactant phase). It should be noted that a pourable viscosity, if desirably used, may also be obtained by vigorous mixing of structurant and benefit agent and that heating is not necessarily required. When such process is followed, the resulting structured benefit agent compositions will have the properties described above (i.e. shear thinning, yield stress etc.) and provide in deposition of the structured benefit agent, when measured from the carrying composition, of 5 % greater, preferably at least 10 % greater relative to level of deposition of benefit agent to substrate from final composition if the benefit agent had not been structured, or the benefit agent not being in the presence of the final formulation of a structured benefit agent. In one embodiment, the carrying composition is liquid, and there is resulting deposition of structured benefit agent of at least at least about 60 µg/cm2, preferably at least about 75 µg/cm2, more preferably at least about 100 µg/cm2. In another embodiment, when measured from a bar, resulting deposition of benefit agent is at least about 5 µg/cm2. wherein the pre-mix (structured benefit agent) is delivered to liquid compositions as a separate pre-mix; and wherein deposition of oil/emollient from the liquid composition onto substrate is greater than 5 %, preferably greater than 10 % relative to deposition of same benefit agents not present in accordance with invention. In addition, when the structured benefit agent is used, there is an improvement of the benefit provided by the optical modifier of at least 5 % than if the structured benefit agent is not used. For example, in one embodiment, the optical modifier may be present when mixed as part of a pre-mix forming a delivery vehicle (2) above or added outside the pre-mix and use of structured benefit agent may result, in one embodiment where the benefit is shine, in a shine enhancement of at least about 5 intensity units. In the specific liquid embodiment noted above, oil benefit agents will have deposition onto substrate of greater than 60 µg/cm2 . wherein deposition of oil from the composition onto substrate is greater than 5 %, preferably greater than 10 % relative to deposition of same benefit agent not prepared in accordance with the invention. In the specific bar embodiment noted, oil benefit agents will have deposition onto substrate of greater than 5 µg/cm2. The composition can also contain a surfactant, especially if the product form is a liquid or bar, which can typically comprise an anionic surfactant. The anionic surfactant may be, for example, an aliphatic sulfonate, such as a primary alkane (e.g., C8-C22) sulfonate, primary alkane (e.g., C8-C22) disulfonate, C8-C22 alkene sulfonate, C8-C22 hydroxyalkane sulfonate or alkyl glyceryl ether sulfonate (AGS); or an aromatic sulfonate such as alkyl benzene sulfonate. wherein R is an alkyl or alkenyl having 8 to 18 carbons, preferably 12 to 18 carbons, n has an average value of greater than 1.0, preferably between 2 and 3; and M is a solubilizing cation such as sodium, potassium, ammonium or substituted ammonium. Ammonium and sodium lauryl ether sulfates are preferred. The anionic may also be alkyl sulfosuccinates (including mono- and dialkyl, e.g., C6-C22 sulfosuccinates); alkyl and acyl taurates, alkyl and acyl sarcosinates, sulfoacetates, C8-C22 alkyl phosphates and phosphates, alkyl phosphate esters and alkoxyl alkyl phosphate esters, acyl lactates, C8-C22 monoalkyl succinates and maleates, sulphoacetates, and acyl isethionates. where M is as defined above. wherein n = 1 to 20; and M is as defined above. wherein R ranges from C8 to C20 alkyl and M is a solubilizing cation. 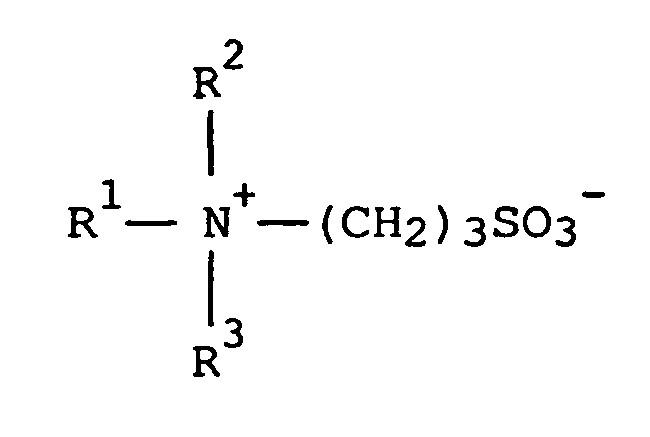 wherein R2 ranges from C8-C20 alkyl, R3 ranges from C1-C4 alkyl and M is a solubilizing cation. 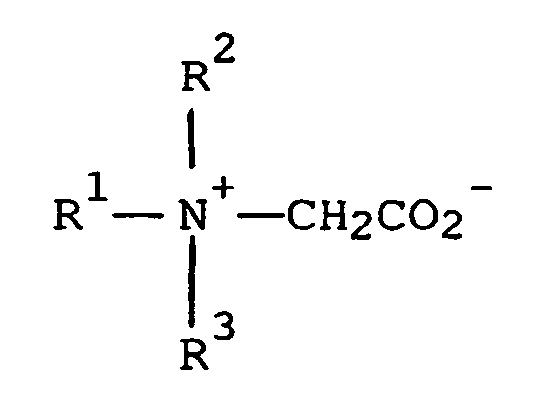 wherein R is C8 to C20 alkyl; n is 0 to 20; and M is as defined above. Another carboxylate which can be used is amido alkyl polypeptide carboxylates such as, for example, Monteine LCQ(R) by Seppic. Another surfactant which may be used are the C8-C18 acyl isethionates. These esters are prepared by reaction between alkali metal isethionate with mixed aliphatic fatty acids having from 6 to 18 carbon atoms and an iodine value of less than 20. At least 75 % of the mixed fatty acids have from 12 to 18 carbon atoms and up to 25 % have from 6 to 10 carbon atoms. Acyl isethionates, when present, will generally range from about 0.5 % to 15 % by weight of the total composition. Preferably, this component is present from about 1 % to about 10 %. The acyl isethionate may be an alkoxylated isethionate such as is described in Ilardi et al., U.S. Patent No. 5,393,466 , hereby incorporated by reference into the subject application. Another surfactant which may be used are C8 to C22 neutralized fatty acids (soap). Preferably, the soap used are straight chain, saturated C12 to C18 neutralized fatty acids. In general the anionic component will comprise from about 1 % to 20 % by weight of the composition, preferably 2 % to 15 %, most preferably 5 % to 12 % by weight of the composition. wherein R2 contains an alkyl, alkenyl, or hydroxy alkyl radical of from about 8 to about 18 carbon atoms, from 0 to about 10 ethylene oxide moieties and from 0 to about 1 glyceryl moiety; Y is selected from the group consisting of nitrogen, phosphorus, and sulfur atoms; R3 is an alkyl or monohydroxyalkyl group containing about 1 to about 3 carbon atoms; X is 1 when Y is a sulfur atom, and 2 when Y is a nitrogen or phosphorus atom; R4 is an alkylene or hydroxyalkylene of from about 1 to about 4 carbon atoms and Z is a radical selected from the group consisting of carboxylate, sulfonate, sulfate, phosphonate, and phosphate groups. where m is 2 or 3. In both formulae R1, R2 and R3 are as defined previously. R1 may in particular be a mixture of C12 and C14 alkyl groups derived from coconut so that at least half, preferably at least three quarters of the groups R1 have 10 to 14 carbon atoms. R2 and R3 are preferably methyl. In these formulae R1, R2 and R3 are as discussed previously. Amphoacetates and diamphoacetates are also intended to be covered in possible zwitterionic and/or amphoteric compounds which may be used. The amphoteric/zwitterionic surfactant, when used, generally comprises 0 to 25 %, preferably 0.1 % to 20 % by weight, more preferably 5 % to 15 % of the composition. In addition to one or more anionic and optional amphoteric and/or zwitterionic, the surfactant system may optionally comprise a nonionic surfactant. The nonionic which may be used includes in particular the reaction products of compounds having a hydrophobic group and a reactive hydrogen atom, for example aliphatic alcohols, acids, amides or alkyl phenols with alkylene oxides, especially ethylene oxide either alone or with propylene oxide. Specific nonionic detergent compounds are alkyl (C6-C22) phenols-ethylene oxide condensates, the condensation products of aliphatic (C8-C18) primary or secondary linear or branched alcohols with ethylene oxide, and products made by condensation of ethylene oxide with the reaction products of propylene oxide and ethylenediamine. Other so-called nonionic detergent compounds include long chain tertiary amine oxides, long chain tertiary phosphine oxides and dialkyl sulphoxides. The nonionic may also be a sugar amide, such as a polysaccharide amide. Specifically, the surfactant may be one of the lactobionamides described in U.S. Patent No. 5,389,279 to Au et al. which is hereby incorporated by reference or it may be one of the sugar amides described in Patent No. 5,009,814 to Kelkenberg , hereby incorporated into the subject application by reference. Other surfactants which may be used are described in U.S. Patent No. 3,723,325 to Parran Jr. and alkyl polysaccharide nonionic surfactants as disclosed in U.S. Patent No. 4,565,647 to Llenado , both of which are also incorporated into the subject application by reference. wherein R2 is selected from the group consisting of alkyl, alkylphenyl, hydroxyalkyl, hydroxyalkylphenyl, and mixtures thereof in which alkyl groups contain from about 10 to about 18, preferably from about 12 to about 14, carbon atoms; n is 0 to 3, preferably 2; t is from 0 to about 10, preferably 0; and x is from 1.3 to about 10, preferably from 1.3 to about 2.7. The glycosyl is preferably derived from glucose. To prepare these compounds, the alcohol or alkylpolyethoxy alcohol is formed first and then reacted with glucose, or a source of glucose, to form the glucoside (attachment at the 1-position). The additional glycosyl units can then be attached between their 1-position and the preceding glycosyl units 2-, 3-, 4- and/or 6-position, preferably predominantly the 2-position. The benefit agent portion of the structured liquid may be any of the benefit agents described previously in the section relating to the benefit agent and additionally comprises optical modifiers. Similarly, the crystalline structurant may be any one of the materials described above. The pre-mix/delivery vehicle is also as described above. As indicated earlier, the pre-mix should be made separately and it can be liquid (molten), semi-molten or solid before adding to final carrying composition. When used in a liquid, the pre-mix may be in pourable or flowable state (viscosity is lower than 250 Pa-s, more preferably lower than 200 Pa-s, most preferably lower than 150 Pa-s) before adding to final carrying composition (e.g. liquid composition). When using the benefit agent pre-mix of the invention (either structured benefit agent or being in the presence of structured benefit agent), even if added separately from pre-mix, the benefit agent will deposit in an amount at least 5 % or greater, preferably at least 10 % or greater than if no structured benefit agent is present in the final formulation. Moreover, because of enhanced deposition using structured benefit agent, there will be improved benefit (e.g., shine enhancement, improved matte appearance) of at least about 5 % relative to if no structured benefit agent is used. In one embodiment, when used in a liquid, a benefit agent oil will permit deposition of greater than 60 µg/cm2, preferably greater than about 75 µg/cm2, more preferably greater than 100 µg/cm2 and this deposition is not dependent on large droplet size of the structured benefit agent. Furthermore, in a specific embodiment, such improved deposition results in shine enhancement of greater than about 5 intensity units as measured by shine intensity test described in the protocol section. In a second embodiment when used in a bar composition, a benefit agent oil will have deposition of greater than 5 µg/cm2 and this deposition is not dependent on large droplet size of the structured benefit agent. The compositions (especially bar compositions) may also contain 0.1 % to 80 % by wt., preferably 5 % to 70 % by wt. of a structurant and/or filler. Such structurants can be used to enhance the bar integrity, improve the processing properties, and enhance desired user sensory profiles. The structurant is generally long chain, preferably straight and saturated, (C8-C24) fatty acid or salt thereof or ester derivative thereof; and/or branched long chain, preferably straight and saturated, (C8-C24) alcohol or ether derivatives thereof. A preferred bar structurant is polyalkylene glycol with molecular weight between 2,000 and 20,000, preferably between 3,000 and 10,000. Those PEG's are commercially available, such as those marketed under the tradename of CARBOWAX SENTRY PEG8000(R) or PEG4000(R) by Union Carbide. Other ingredients that can be used as structurants or fillers include starches, preferably water soluble starches such as maltodextrin and polyethylene wax or paraffin wax. Structuring aids can also be selected from water soluble polymers chemically modified with hydrophobic moiety or moieties, for example, EO-PO block copolymer, hydrophobically modified PEGs such as POE(200)-glyceryl-stearate, glucam DOE 120 (PEG 120 Methyl Glucose Dioleate), and Hodag CSA-102 (PEG-150 stearate), and Rewoderm(R) (PEG modified glyceryl cocoate, palmate or tallowate) from Rewo Chemicals. 12-Hydroxy stearic acid may be used as a component of the bar structuring system. Such structurants are described for example in U.S. Patent No. 6,458,751 to Abbas et al. , hereby incorporated by reference into the subject application. Perfumes (as described in section on benefit agents); sequestering agents, such as tetrasodium ethylenediaminetetraacetate (EDTA), EHDP or mixtures in an amount of 0.01 % to 1 %, preferably 0.01 % to 0.05 %; and coloring agents, opacifiers and pearlizers such as zinc stearate, magnesium stearate, TiO2, EGMS (ethylene glycol monostearate) or Lytron 621 (Styrene/Acrylate copolymer); all of which are useful in enhancing the appearance or cosmetic properties of the product. The compositions may further comprise antimicrobials such as 2-hydroxy-4,2'4' trichlorodiphenylether (DP300); preservatives such as dimethyloldimethylhydantoin (Glydant XL1000), parabens, sorbic acid etc. The compositions may also comprise coconut acyl mono- or diethanol amides as suds boosters, and strongly ionizing salts such as sodium chloride and sodium sulfate may also be used to advantage. Antioxidants such as, for example, butylated hydroxytoluene (BHT) may be used advantageously in amounts of about 0.01 % or higher if appropriate. Cationic polymers which may be used include Quatrisoft LM-200 Polyquaternium-24, Merquat Plus 3330 - Polyquaternium 39; and Jaguar(R) type cationics. Another ingredient which may be included are ex-foliants such as polyoxyethylene beads, walnut shells and apricot seeds. Cationic polymers, like other benefit agents, may be included in the bar surfactant/structurant filler carrying composition, or they may be added into the pre-mix benefit delivery vehicle along with the wax. Typically, bars will also comprise 1 % to 30 %, preferably 2 to 20 % water. The amount of water may vary depending on type of process and structuring material used. The non-bar, preferably liquid compositions of the invention may include optional ingredients as follows. Another optional element of the invention is an emulsion stabilizer (found in, for example, in a liquid aqueous phase). The dispersion stabilizer is intended to provide adequate storage stability to the composition (i.e., so the benefit agent delivery vehicle is stable in the composition). The structured composition otherwise may be prone to separate under the action of gravity (e.g. creaming or sedimentation depending upon its density). The structured composition of the invention may also be prone to sticking together and coalescing. The most effective dispersion stabilizers are those that can provide an adequate structure to the liquid, e.g., aqueous phase to immobilize the droplets, thus preventing both gravitational separation and collision with other droplets. However, if the dispersion is too stable, the droplets of structured composition are inhibited from coming into proximity with the skin and thus effectively depositing. Therefore, the most effective dispersion stabilizers provided have excellent stability in the container, but lose their effectiveness in immobilizing the structured benefit agent when they are applied to wet skin. Aqueous dispersion stabilizers useful in the instant invention can be organic, inorganic or polymeric stabilizers. Specifically, the compositions comprise 0.1 % to 10 % by wt. of an organic, inorganic or polymeric stabilizer which should provide physical stability of the large structured oil droplets in the surfactant composition at 40°C for over four weeks. Inorganic dispersion stabilizers suitable for the invention include, but are not limited to clays, and silicas. Examples of clays include smectite clay selected from the group consisting of bentonite and hectorite and mixtures thereof. Synthetic hectorite (laponite) clay used in conjunction with an electrolyte salt capable of causing the clay to thicken (alkali and alkaline earth salts such as halides, ammonium salts and sulfates) is particularly useful. Bentonite is a colloidal aluminum clay sulfate. Examples of silica include amorphous silica selected from the group consisting of fumed silica and precipitated silica and mixtures thereof. Organic dispersion stabilizers are defined herein as organic molecules that have a molecular weight generally lower than 1000 Daltons, and form a network in the aqueous phase that immobilizes the dispersed structured oil phase. This network is comprised either of amorphous solids, crystals, or liquid crystalline phase. Suitable organic dispersion stabilizers for the instant invention are well know in the art and include, but are not limited to any of several types of long chain acyl derivatives or mixtures thereof. Included are the glycol mono- di- and triesters having about 14 to about 22 carbon atoms. Preferred glycol esters include the ethylene glycol mono- and distearates, glyceryl stearates, palm oil glyceride, tripalmitin, tristearin and mixtures thereof. Another example of organic dispersion stabilizers are alkanolamides having from about 14 to about 22 carbon atoms. Preferred alkanolamides are stearic monoethanolamide, stearic diethanolamide stearic monoisopropanolamide, stearic monoethanolamide stearate and mixtures thereof. Still another class of useful dispersion stabilizer is long chain fatty acid esters such as stearyl stearate, stearyl palmitate, palmityl palmitate, trihydroxystearylglycerol and tristearylglycerol. Another type of organic dispersion stabilizer is the so-called emulsifying waxes such as mixtures of cetostearyl alcohol with polysorbate 60, cetomacriogol 1000, cetrimide; a mixture of glycerol monostearate with a stearic soap, and partially neutralized stearic acid (to form a stearate gel). Still another example of a suitable dispersion stabilizing agent is long chain amine oxides having from about 14 to about 22 carbon atoms. Preferred amine oxides are hexadecyldimethylamine oxide and octadecyldimethylamide oxide. Example of a suitable polymeric dispersion stabilizing agents useful in the present invention include carbohydrate gums such as cellulose gum, microcrystalline cellulose, cellulose gel, hydroxyethyl cellulose, hydroxypropyl cellulose, sodium carboxymethylcellulose, hydroxymethyl carboxymethyl cellulose, carrageenan, hydroxymethyl carboxypropyl cellulose, methyl cellulose, ethyl cellulose, guar gum (including cationic guar gums such as Jaguar®), gum karaya, gum tragacanth, gum arabic, gum acacia, gum agar, xanthan gum, and mixtures thereof. Preferred carbohydrate gums are the cellulose gums and xanthan gum. An especially preferred type of polymeric dispersion stabilizer agents includes acrylate containing homo- and copolymers. Examples include the crosslinked polyacrylates sold by B.F. Goodrich under the CARBOPOL trade name; the hydrophobically modified cross linked polyacrylates sold by B.F. Goodrich under the PEMULEN trade name; and the alkali swellable acrylic latex polymers sold by Rohm and Haas under the ARYSOL or ACULYN trade names. The above dispersion stabilizers can be used alone or in mixtures and may be present in an amount from about 0.1 wt. % to about 10 wt. % of the composition. Other suitable ingredients include perfume, which may be the combination of several fragrances, and may be selected on the basis of the ability of the fragrances to be incorporated into the benefit agent delivery vehicle to provide enhanced fragrance delivery/benefit(s). However, as noted, perfume may also comprise a separate benefit agent which may be entrapped in a network formed by different structured benefit agent, or may be added separately to the composition and not as part of the pre-mix. Organic solvents, such as ethanol; auxiliary thickeners, such as carboxymethylcellulose, magnesium aluminum silicate, hydroxyethylcellulose, methylcellulose, carbopols, glucamides, or Antil(R) from Rhone Poulenc; perfumes; sequestering agents, such as tetrasodium ethylenediaminetetraacetate (EDTA), EHDP or mixtures in an amount of 0.01 % to 1 %, preferably 0.01 % to 0.05 %; and coloring agents, opacifiers and pearlizers such as zinc stearate, magnesium stearate, TiO2, EGMS (ethylene glycol monostearate) or Lytron 621 (Styrene/Acrylate copolymer); all of which are useful in enhancing the appearance or cosmetic properties of the product. Antioxidants such as, for example, butylated hydroxytoluene (BHT) and Vitamin A, C & E or their derivatives may be used advantageously in amounts of about 0.01 % or higher if appropriate. Thickeners which may be used include Amerchol Polymer HM 1500 (Nonoxynyl Hydroethyl Cellulose); Glucam DOE 120 (PEG 120 Methyl Glucose Dioleate); Rewoderm(R) (PEG modified glyceryl cocoate, palmate or tallowate) from Rewo Chemicals; Antil(R) 141 (from Goldschmidt). Another optional ingredient which may be added are the deflocculating polymers such as are taught in U.S. Patent No. 5,147,576 to Montague , hereby incorporated by reference. Another ingredient which may be included are ex-foliants such as polyoxyethylene beads, walnut sheets and apricot seeds. Another preferred ingredient is a crystallization suppressant or control agent which is used to suppress individual or mixtures of sunscreen ingredients from crystallizing out of solution. This may lead to reduced deposition. These suppression agents include, for example, organic esters such as C10-C24, preferably C12-C15 alkyl benzoate among others. Other examples include Bernel PCM from Bernel, and Elefac 205 from Bernel. Specific sunscreen(s) are more resistant to crystallization than others, e.g., butyl octyl salicylate. Except in the operating and comparative examples, or where otherwise explicitly indicated, all numbers in this description indicating amounts or ratios of materials or conditions or reaction, physical properties of materials and/or use are to be understood as modified by the word "about". Unless indicated otherwise, all percentages are intended to be percentages by weight. Further, all ranges are to be understood to encompass both the ends of the ranges plus all numbers subsumed within the ranges. Sodium lauryl ether sulfate (SLES) was Steol CS330 from Stepan Co. (Northfield, IL). Cocamidopropyl betaine (CAPB) was Tego Betaine F50 from Goldschmidt Chemical Corp. (Hopewell, VA). Refined sunflower seed oil was supplied by Welch, Holme and Clark Co., Inc. (Newark, NJ). The petrolatum was white petrolatum from Penreco (Karns City, PA). The hydrogenated oils are commercially available from many manufacturers and were directly added to the formulations without further modification. Hydrogenated coconut, palm kernel, rapeseed and vegetable oils were supplied by Jarchem Industries, Inc. (Newark, NJ). Castorwax was supplied by CasChem, Inc. (Bayonne, NJ) Hydrogenated cotton seed oil, Stearine 07 supplied by Loders Croklaan. The commercially available AquaPel 15L from ExxonMobil Chemical (Edison, NJ) is a linear butadiene-isoprene copolymer (Mw 15,000). Other materials used in the production of example bar formulations were as follows: propylene glycol supplied by Ruger Chemical Company; Pricerine 4911 palmitic-stearic acid supplied by Uniqema; sodium cocoyl isethionate and 82/18 soap supplied by Lever; Mackam 1L supplied by McIntyre Group Ltd.; Emery 916 glycerine supplied by Cognis Corporation; Superhartolan by Croda; and polyethylene glycols from the Pluracol series supplied by BASF. Small batches of liquid cleanser prototypes were mixed using an overhead stirrer equipped with a high-efficiency paddle. Formulations were prepared in 250 ml stainless steel beakers which were placed in a thermally-controlled water bath (± 1.0 °C) . Structured (e.g., hydrogenated oil structured) benefit agent pre-mixes (delivery vehicles) were prepared at temperatures at or just above the melting points of the structurant or other mixtures of benefit agent structuring component. Typically, the structuring material was weighed into a 125ml stainless steel beaker and then the appropriate amount of benefit agent (e.g., sunflower seed oil) was added based on the formulation specifications. The components were then heated by placing the beaker in a thermally-controlled water bath to melt the structuring material (e.g., wax or hydrogenated oil). The molten structured oil was stirred with a sigma blade mixer until uniformly mixed and, for liquid compositions, maintained at the elevated temperature until use (usually no more than 5 min). For bar compositions, the mixture was then either maintained at elevated temperature until its incorporation into a base formulation (i.e. a mixture of surfactants and bar structuring aids), or was allowed to cool to ambient temperature for incorporation into a bar base formulation. Optical modifiers were added with the molten structured oil prior to dispersion of the structured oil with the surfactant phase. Liquid cleanser formulations were prepared under similar processing conditions except for differences in mixing temperatures as necessary, due to the varying melting temperatures of the structurants. Formulations were prepared in 250ml stainless steel beakers immersed in a thermally-controlled water bath. First the SLES and CAPB along with additional water were added together and mixed at 100 to 150 rpm for 5 min using an overhead stirrer. Mixing was continued until homogeneous while the temperature was raised to that of the wax-oil pre-mix. Just prior to addition of the oil phase, the mixing speed was increased to 250 rpm. The molten structured oil pre-mix was then poured into the stirring surfactant mixture and stirred (about 20 minutes) while maintaining the elevated temperature. Whenmixing was completed, the finished product was removed from the temperature bath and allowed to cool to room temperature without further stirring. In the examples, component amounts are given as a weight percentage of the composition. Bars produced via a melt cast process route were made in Pyrex mixing vessels heated with electric heating mantles. Multiple turbine blades controlled with adjustable speed electric motors provided agitation for the vessel. Formulations were manually poured into polypropylene molds for cooling and solidification. The base bar compositions were prepared by melting the bar structuring aids followed by addition of surfactants, and then any additional components of the base formulation as required. Bars produced via an extrusion process were mixed in a Patterson sigma blade mixer. The base bar carrying compositions were prepared by mixing components in the order described for the cast-melt process above. The compositions were then passed over a chill roll set at 15°C. The flakes from the chill roll were then extruded through a Weber Seelander laboratory scale plodder. Bars were stamped on a Sigma Engineering air-driven press. Silflo silicone rubber material (Flexico Developments, England) was used as received. Silflo replica surfaces for deposition trials were prepared with surface roughness to approximate the skin surface roughness. About 5 ml of Silflo material was squeezed from the stock bottle onto wax paper. After the addition of 2 - 3 drops of catalyst (supplied with the Silflo) the liquid material will thicken while mixing with a stainless steel spatula (about 30 seconds). A piece of 100 grit sandpaper was cut to 4 x 4 cm square and taped to a surface to leave approximately 2.5 x 2.5 cm exposed. The thickened material was spread evenly over the sandpaper and allowed to dry (about 10 min). Once set, the solid Silflo replica was separated by peeling away the sandpaper, and covering the exposed adhesive side of the tape with new pieces of tape. The replica surface was a negative of the sandpaper surface and thus is textured. The 100 grit was chosen to approximate the surface roughness of skin. Each corner of the 7 cm2 squares on the volar area of forearm were marked with a marker. This area is flat and has even texture, so variation caused by skin stretching was minimized. Baseline images were taken before the product application. After obtaining the baseline images, faucet water was set up to 60 ml per minute. Then 21 µL of a shower gel was pipetted to a testing site. Sample was rubbed for about 15 seconds with a finger-cot, 15 seconds was allowed for waiting and then area was rinsed for 15 seconds. These steps were repeated until all testing sites were finished. There was a 15 minute wait, and three images of each testing site were taken for shine enhancement. All products were tested on three subjects and results were averaged. A Charm-view Microscope was used with a 30X magnification lens under parallel-polarized condition. PhotoSuite III was used to capture images in Bitmap format. A program in IDL was developed to process the captured images and list results in a text file. Average shine intensity for the brightest 30720 pixels was calculated as the shine intensity. Enhancement of skin shine is defined by the difference in shine intensity after product application over the baseline. The amount of sunflower seed oil that deposits from the structured oil formulations was assessed on the Silflo replica surfaces. Newly prepared samples of formulations were tested in triplicate by applying product to the Silflo surface, rubbing in the product, rinsing and then extracting any oil remaining bound to the surface. In practice, 8.6 mg of product was applied per square centimeter of surface. After addition of one drop of tap water, the product was rubbed on the surface with one finger for 15 seconds (approximately 20 circular rubs). The surface was then rinsed with tap water maintained at 37°C and a flow rate of 13 - 14 ml/sec, holding the sample 5 cm away from the tap at an angle of 45°. After rinse, the sample was blotted once with a towel and allowed to air dry for 15 min. The Silflo replica was then cut from the tape border with a razor blade, and placed into a 20 ml glass vial with 10g of hexanes. After mixing with an automatic "wrist action" shaker for 15 min, the Silflo replica was removed from the vial. For analysis of oil content, the extraction solvent was transferred to 1 ml glass vials. Full thickness porcine skin was obtained from Sinclair Research Center, Inc. It was cut into pieces of size 8cm x 10cm. The skin was shaved with a disposable razor, rinsed with warm water and then rinsed with ethyl alcohol (10 ml) and wiped dry with an absorbent paper towel. After cleaning in this manner, the skin was then hydrated for 10 seconds under running tap water set to 100°F. The amount of bar product applied to the skin was 3.3mg/cm2. Thus, the appropriate amount of bar material was weighed out according to the area of skin to be washed, and then an equal amount of water was added to the bar sample and this was then allowed to sit for 15min at ambient temperature in a covered vessel. The slurry so formed was then transferred onto the piece of skin to be washed and spread evenly over the entire surface using one hand covered with a textured latex glove. The skin was then washed over its entire area using the gloved hand, rubbing in a circular motion for 30 sec. The skin was then rinsed under a tap for 10 seconds at a flow rate of 70ml/minute and temperature of 100°F. Excess water was removed by patting the skin with a paper towel. The skin was then allowed to air dry at ambient temperature for 15 minutes. The sunflower seed oil that was deposited on the skin during the wash procedure was recovered by solvent extraction. A glass cylinder (7cm2 area) was firmly placed onto the skin surface, and 2ml of solvent (25:75 (v/v) chloroform: methanol) dispensed into the cylinder and stirred with a glass rod for 1 minute. The solvent was then transferred to a 10ml vial using a disposable plastic pipette. The extraction process was repeated two more times, and all three portions of the solvent were combined in the single vial. The sample was then filtered using a disposable syringe fitted with a 0.45 µm Millipore disposable filter. The solvent was evaporated under nitrogen. Analysis of oil concentration in the hexanes extracts was performed using thin layer chromatography (TLC). Samples were spotted onto TLC plates using an automatic TLC spotter (CAMAG Automatic TLC Sampler 4, CAMAG, Switzerland). Along with the sample extracts, six standard solutions of sunflower seed oil in hexanes were also spotted on each plate. Standards were prepared at concentrations ranging from 125 to 450 µg/g. TLC plates were cleaned before use by soaking first in methanol and then isopropanol for 15 min each, and then dried overnight. After spotting, plates were placed in a glass TLC chamber containing 100 ml of developing solution (70 % hexane, 29 % ethyl ether, 1 % acetic acid). When the solution had travelled ¾ of the plate height, the plate was removed and air dried overnight. After drying, the TLC plates were immersed in staining solution (aqueous solution containing 10 % cupric sulfate, 8 % phosphoric acid). After blotting excess staining solution from the plates, they were heated for 30 mins on a hotplate set at 165°C. For measurement of the deposited oil, the stained plates, now having charred spots representing the deposited oil extracted from the Silflo surfaces, were digitally scanned using a GS-700 Imaging Densitometer (Bio-Rad Laboratories, Hercules, CA). Using the scanning software, the intensity of the sample spots was calculated based on a standard curve generated for the 6 standards applied to the plate. From these apparent intensity values, the concentration of sunflower oil in the extracts was calculated. Quantification of the sunflower seed oil recovered from the deposition trials was via high performance liquid chromatography. Following evaporation of the solvent under nitrogen as described above, the sample was reconstituted in mobile phase solvent (70:30 (v/v) acetone:acetonitrile). LC separation was performed on a Hewlett-Packard Series 1100 HPLC. Detection was via a light-scattering detector, Alltech ELSD 2000. The column used for LC separation was a Waters Symmetry C18 (39x150mm) kept at 30°C. The mobile phase was 70:30 (v/v) acetone:acetonitrile. The flow rate was 0.8ml/min. The sample injection volume was 100 µl. Run time was 18 min. Detector nitrogen flow rate was 0.9L/min, and evaporative tube temperature was 40°C (with impactor OFF). The elution time for the peak of interest was about 6.2 mins. Standards were prepared at concentrations ranging from 10 to 40 ppm of sunflower seed oil. The level of sunflower oil in the extracts was calculated based on the standard curve generated from the standard solutions. Droplet size was measured from images captured of the oil droplets in the formulations. Microscopic images were taken from samples of the body wash prototypes by placing a small amount (< 0.1 ml) onto a glass slide. The sample was gently spread on the slide following placement of a cover slip. Samples were examined at 100x magnification using an optical microscope (Axioplan Model, Carl Zeiss, Inc., Thornwood, NY). The microscope was equipped with a video camera, image processor and video monitor. The camera was connected to a personal computer and images were digitally captured using appropriate software. Using the imaging software, (structured) oil droplets were measured individually. At least 200 droplets were measured for each formulation sample. The Rheometric Scientific ARES controlled strain rheometer (SR-5, RheometricScientific, Piscataway, NJ) was used to determine shear profiles of structured benefit agents used herein. The rheometer was set up with parallel plates 25 mm in diameter typically with 200 to 500 µm gaps between the top and bottom plates. Test temperature was 37 °C. Programmed steady shear rate sweeps were performed where the shear rates were logarithmically varied from 0.1 to 1000 seconds -1, with 5 points recorded per decade (i.e. per factor of ten increase in the shear rate). The shear scan typically takes 5 minutes to complete. The output is viscosity as a function of shear rate. The yield stress values of the structured benefit agents were measured using a Rheometric Scientific Stress Controlled Rheometer model SR-5 (Rheometric Scientific, Piscataway, NJ). Stress ramp tests were performed on samples in stress ranges from 0.2 to 12000 Pa using either a 25mm or 40mm cone and plate fixture. Samples of the structured benefit agent to be tested were loaded between the fixture (top plate) and bottom plate. Using the RSI Orchestrator software supplied with the instrument, tests were conducted by incrementing the applied stress from 0.2 Pa to user defined final stress value. The user also sets testing time typically at 15 minutes. Tests are completed when the sample yields (flows), which is noted by a sharp decrease in sample viscosity as observed as the software plots the experimental data as the test is conducted. Yield stress values were determined from linear plots of the viscosity versus strain. The first data point after the peak of the curve is the yield value. Alternatively, lines can be fit to the linear portions of the curve before and after the peak. The intersection of the line will give the yield value. Yield stress can also be determined from semi-logarithmic plots of the viscosity (Pa-s) against stress (Pa). The yield value is the first data point for stress after the linear portion of the curve at lower stress values. The yield stress values here are to be understood as a critical yield stress value or the value of the stress where the material begins to flow. Five body wash formulations were prepared as described in the protocol section using formulations shown in Table 7 below. Coated mica was added to molten sunflower seed oil: wax pre-mix and then added to the surfactant phase. Table 7. Formulation for shine enhancement study. wherein, the structured benefit agent is separately formed and separately combined with a surfactant containing carrying composition in which the structure benefit agent will be used to deliver benefit agent to a substrate and there is provided enhanced benefit of the water-insoluble particles of at least 5 % relative to the effect provided by the same water-insoluble particles in the absence of structured benefit age in the final composition. A composition according to claim 1, wherein the benefit agent in the structured benefit agent vehicle composition is selected from silicone oils, fats and oils, waxes, hydrophobic plant extracts, hydrocarbons, higher fatty acids, higher alcohols, esters, essential oils, lipids, vitamins, sunscreens, phospholipids and mixtures thereof. A composition according to claim 2, wherein the benefit agent is sunflower seed oil. A composition according to any one of the preceding claims, wherein the natural crystalline wax is selected from mineral waxes, petroleum based waxes, plant or vegetable waxes and animal waxes. A composition according to claim 4, wherein the petroleum based wax is paraffin or microcrystalline wax. A composition according to claim 4, wherein the synthetic crystalline wax is polyethylene, a polymethylene, a chemically modified wax, polymerized α-olefins and synthetic animal waxes. A composition according to any one of the preceding claims, wherein the structured benefit agent composition is formed by combining benefit agent and structurant at temperatures above melting point of structurant to form a molten solution prior to cooling or to combining the molten solution with the carrying composition. A composition according to claim 1, wherein the benefit agent has a droplet weight average diameter is less than 500 µm. A composition according to any one of the preceding claims comprising 1% to 75 % surfactant. A composition according to any one of the preceding claims, wherein there are one or more additional benefit agents entrapped in network formed by the delivery vehicle composition (2). A method of enhancing visual appearance of skin comprising applying to skin or other substrate a personal product composition according to claim 1.